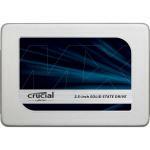 Crucial MX300 CT275MX300SSD1 275GB Expert Reviews - Read Reviews and Buy Smarter Online. Verdict: While the MX300 series cannot be located in an enthusiast class SSD series based solely on write performance, we also have to acknowledge that its lower write performance is incredibly relative. Would you really notice the difference in-between 400 and 500 MB/sec writes? Verdict: Today we've got the Crucial MX300 750GB SSD on the old BCCHardware test bench. The MX300 series of SSD drives from Crucial are their top-tier drives and offer more performance than the previous MX200 series of drives. Verdict: Just like the 750GB limited edition model the 525GB variant of the MX300 line of SSDs performed very well and although it couldn't keep up with its higher capacity brother (we will also test one of the even higher models to check and see how those do) we really have no complaints. Verdict: If you're looking for a large capacity solid state drive that doesn't break the bank, then the Crucial MX300 1050GB is definitely worth considering, offering plenty of features and decent performance. Verdict: While Sata 6Gbps may have a 550MB/s bottleneck, such performance is more than adequate for a vast majority of users wanting a slice of the SSD cake. In recent times the cost per GB of Sata-based SSDs has plummeted meaning there has never been a better time to move away from aging mechanical storage. Verdict: Crucial's move to give the "MX" branding to the MX300 slightly tarnishes the reputation of the MX Series in my opinion. You can usually count on "MX" to stand for the highest possible performance, whereas "BX" stands for budget. Read full review at techPowerUp! Verdict: The 1TB version of the MX300 is a great all-around SSD with good-enough performance, advanced features, and solid software-at a very affordable price. Verdict: Taking everything together, the Crucial MX300 delivers consistent performance across the board. While it may not be the fastest drive, it able to offer a great bang for the buck as a good all around drive. Verdict: The MX300 SSD series offers several, somewhat different, capacities with the 2050GB being the highest. Like all of the drives in the series, the 2050GB comes with Adaptive Thermal Protection to help keep the drive cool and protects data with both AES 256-bit encryptions and RAIN technology. Verdict: If my review of the first solid-state drive with 3D flash memory, the well-balanced Samsung SSD 850 Evo , piqued your interest, you'll be happy to know there's a new player in town: the all-new MX300 drive from Crucial. Verdict: With the Crucial MX300, you have to take the good with the bad. There are several points to consider, and the pro's and cons each have several items that give us a full picture of the overall drive. Let's start at the SSD controller, which is the heart of the system. Verdict: Fast read and write speeds aren't the only things the MX300 has to offer. Along with thermal and power loss protection, TRIM support and active garbage collection, the drive features AES 256-bit full disk encryption and is compatible with both the TCG Opal and IEEE 1667 specifications. Verdict: Micron; Crucial's parent company, is the second to market with 3D NAND flash in a consumer SSD, which it developed with Intel. Samsung was the first, and uses its own implementation for the 850 Pro range. Verdict: Final Thoughts So the MX300 is the first consumer product to make use of Micron's 3D TLC NAND. Crucial took a different approach than Samsung with their first 3D NAND product. The MX300 is not designed to be the fastest consumer SATA SSD out there like Samsung's 850 Pro. Verdict: If you don't own an SSD by now, you really should. Nothing is quite as satisfying as seeing Windows boot up in mere seconds, versus the half a minute or more it sometimes takes with traditional hard disk drives. Verdict: Well, dye my hair red and call me Harpo. A triple-level-cell (TLC) NAND-based SSD that I can recommend to users without a lot of caveats finally exists. That is, only if they can't find a like-priced multi-level-cell (MLC) drive. (And only then.) The drive in question? Verdict: The MX300 750GB Limited Edition SSD is easily the most divisive model Crucial has released in a long, long while. It is obvious that Micron and by extension Crucial is using this SSD has a proving ground of sorts, strives to accomplish great things with new technology but doing so carefully. Verdict: The MX300 750GB solid state drive is a very impressive unit in terms of performance and the sweet spot it seems to have found in terms of price and capacity. The read and write speeds may not be the fastest possible, but 530MB/s and 510 MB/s, respectively, are definitely very respectable. Verdict: The new 2.5-inch 7mm MX300 750GB Limited Edition from Crucial uses the groundbreaking 3D NAND flash technology from Micron (compare to the predecessor Crucial MX200 ). At the moment, it's only available in 750GB capacity (hence the limited edition) but expect more to come later this year. Verdict: Two years ago, Samsung burst onto the market with the 850 Pro - its first SSD with 3D flash memory, with high speeds and correspondingly high prices - and followed that up with the more affordable 850 Evo . Verdict: The Crucial MX300 750GB (Limited Edition) SSD may well be equipped with 3D NAND and that may well be the latest technology, but in the real world and in Gaming you'd be had pushed to know. The bottom line is that the MX300 is simply a decent SSD at a decent price with an unusual capacity. Verdict: Crucial is a global brand of Micron Technology, Inc., one of the largest memory and flash storage manufacturers in the world. They make computer memory upgrades (DRAM) and solid state drives (SSDs), and offer more than 250,000 upgrades for over 50,000 systems. Verdict: A great performance and endurance, as well as a large capacity for very little money, make the Crucial MX300 a great HDD replacement. Verdict: Installed this drive in an OWC external array (using a newertech AdaptaDrive) and connected to my MacPro via Thunderbolt 2. Mechanical installation was simple. My MacPro immediately recognized it and initialization via the Mac OS disk utility was simple. Verdict: When it comes to performance, computers are only as fast as the slowest component. In my case the hard drive was a big bottleneck. Since installing the crucial drive boot up is way quicker, application startup is faster too. Verdict: Always had issues with my hard drive. Apple replaced the connector cable at least 3 times but never changed the actual hard drive. My problems have been solved since I got a new hard drive. Would recommend. Verdict: Crucial down loadable software for installation also works well. I cloned my original hard drive to the new SSD then fitted the new drive into my Dell. All worked well first time.The ability to check compatibility on your web site is reassuring when choosing products. Thanks. Best upgrade I've ever made! Verdict: The hard drives in my Samsung laptop crash on me(once from a drop and the other randomly happened) within a year. I made the change to this SSD and once I got Windows 10 loaded I immediately noticed how much quieter and cooler my laptop became and how quickly Windows loaded. Crucial 525GB Quiet hard drive! Verdict: SATA Drive 525 GB. I kept hearing my camera recorder's hard drive running. Eventually I knew it wouldn't last long so I ordered this unit and popped it in my GW NVR. No external formatting needed. Now I have peace and quiet. When the price drops on the 1Gb I'll definitely check with Crucial first. Verdict: I have postponed writing this review for long enough. I bought these drives because Crucial has, in my opinion, dominated the memory market for an age. I figured they knew what they were doing. Boy was I wrong. These drives are totally useless. They cannot and will not hold any data beyond 30 days. Cons: Advertised as a 525 GB SSD, Only has 488.5 GB of usable space and 500 MB of that is reserved space. Verdict: Easy to install and comes with a software key to expedite migrating data. Verdict: It's an SSD and it works. Thats all I wanted, so I'm happy. Verdict: Glad I listened to the advice of PB Tech staff and purchased online the Crucial 275 GB SSD instead of another brands similar priced 256 GB SSD that was in stock. I replaced the drive in an older i3 laptop, installed Zorin 11 and now have a laptop that is super fast and responsive. Verdict: This SSD made my wife's laptop faster than day out of box in 2009. She wears a helmet and goggles for safety, cause it is scary fast now....anyone can install it, really easy and fun to see it work so well. Verdict: Item as described. Good performance.